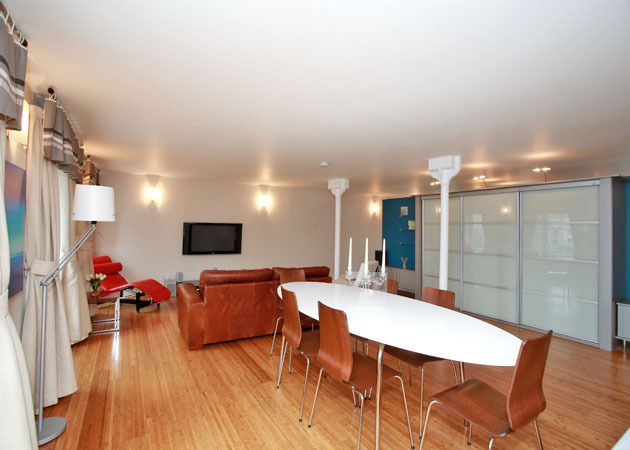 2 Bdrm 1st flr Listed Grade A flat. Hall. Lounge/Kitch/Dining area. 2 Bdrms. Bathrm (CT band - E). Parking. 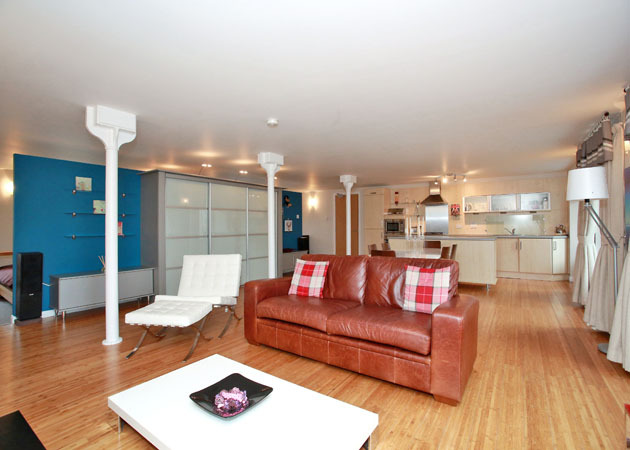 Fixed price £257,500 Entry by arr. Viewing contact solicitors. Below Home Report Valuation (EPC band - B). 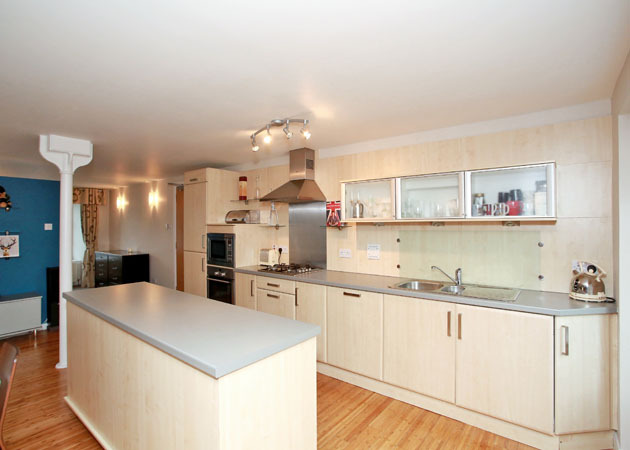 We are delighted to offer for sale this IMMACULATELY PRESENTED TWO BEDROOM FLAT, situated within the popular residential development of Grandholm Village. This modern yet sympathetic conversion of the Grade 'A' Heritage Listed Grandholm Mill completed by Cala Homes in 2006, provides contemporary living with the grand designs wow factor. Highly exclusive as only one of twelve apartments within a very quiet building, which has a high number of professional owner occupiers. The property benefits from a unique floor open plan design creating an incredibly bright and spacious atmosphere, one that can surely only be appreciated upon internal viewing due to its unique nature. The primary living space includes the Kitchen, Lounge, Dining Area and two Double Bedrooms, which is intelligently designed to enjoy the freedom and natural light flow afforded by open living. 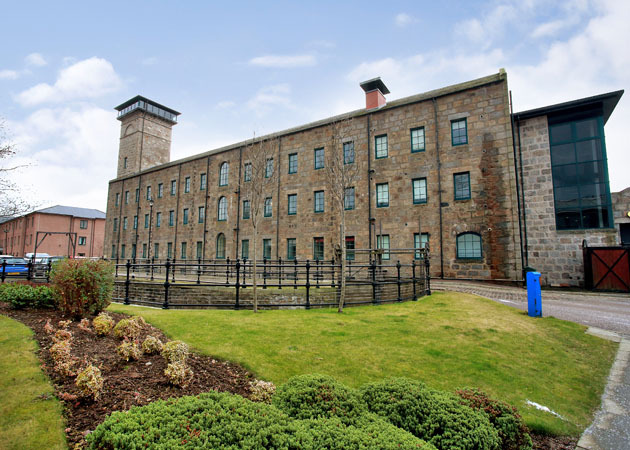 This area boasts no less than eight double glazed sash and case windows, with Northern windows benefiting from the additional privacy of the adjoining rooftop of the Mill's former pump house. The southern aspect, from the bedrooms, provides the view of the Mill water way. 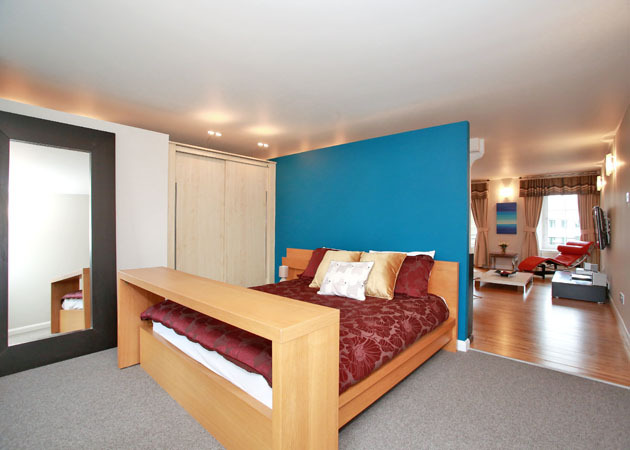 The room division utilises a modern and stylish partial wall with integrated wardrobes and storage. The future owner can choose to fully enclose the rooms to provide additional privacy, as approval precedents exist. 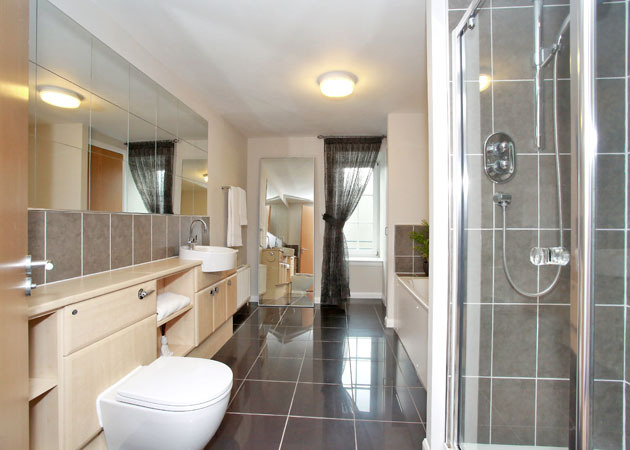 The property also benefits from an exceptionally spacious bright Hallway with multiple large storage cupboards and incredibly large Bathroom along with Gas Central Heating, Full Double Glazing and Private Parking. The property undoubtedly offers the purchaser the rare opportunity to acquire a property of such stature within a sought after development and to take occupancy with the minimum of inconvenience or work required. 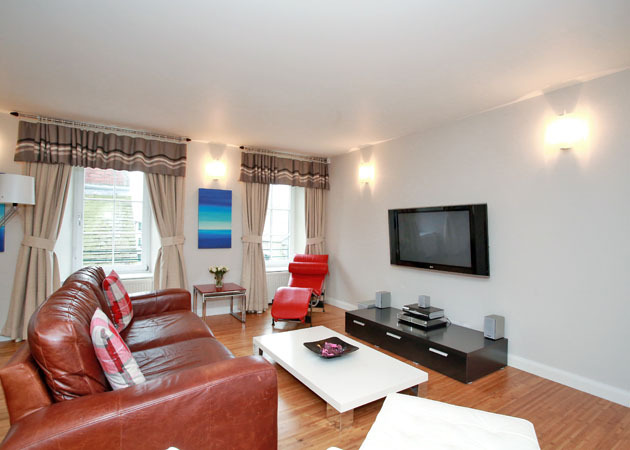 The property was been fully repainted within the last year, and has been maintain in excellent condition by its only owner. 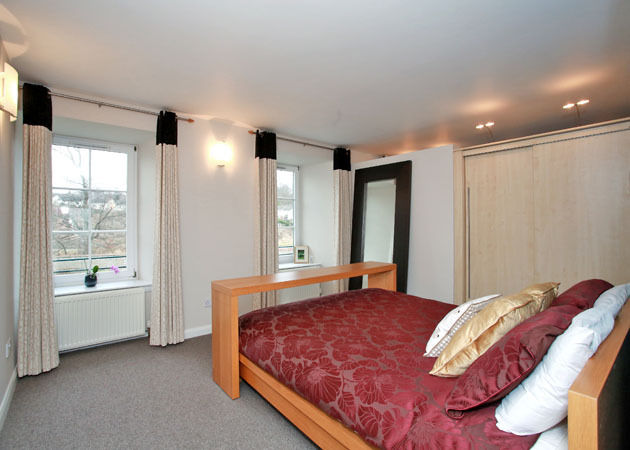 The property is to be sold inclusive of all floor coverings, curtains, blinds and white goods. Further furnishings are to made be available under separate negotiation, which could enable an easy transition into this modern home. Grandholm Village is a highly acclaimed development which has a variety of house styles and finishes, with this particular property being the historical cornerstone of the development. The village substantial grounds are owned & managed by the residents via the resident’s association. The future owner will be able to enjoy the grounds which boasts the Lady of Grandholm sculpture by highly acclaimed 'Kelpies' creator Andy Scott. The location often confused to be with Bridge of Don, offers surprisingly easy access to most parts of the City due to its location relative to arterial routes. The access time to the city centre, which is current only 8-10 minutes via private resident’s bridge access will further improve with the completion of the 3rd don crossing due at the end Q1 2016. Local 'village' amenities include local shop, hairdressers, beauticians/spa and dentist. An excellent range of shopping further facilities are available within a short walk or 5-minute drive to the Tesco Extra Danestone, with good Primary and Secondary Schools also being available nearby. 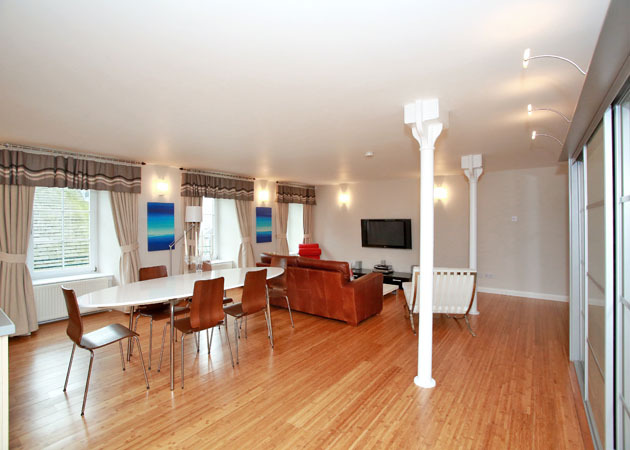 The location is also extremely convenient for the Airport (10-15 mins) and oil-related offices at both Bridge of Don and Dyce. DIRECTIONS Travelling from the city centre proceed onto King Street and continue North towards the Bridge of Don. After crossing the Bridge of Don turn left at the first set of traffic lights onto Balgownie Road, follow this road and veer to your left. Turn left where the signpost indicates Grandholm Village and left again onto Grandholm Crescent. The Mill House development is situated a short distance ahead in your right hand side. Quick access to the City and North is afforded by the new third Don Crossing. Fast access to the West of the City (Dyce and Airport) via Great Northern Road is still by the private bridge accessible with a key fob. ENTRANCE HALLWAY 17’ x 9’ approx. 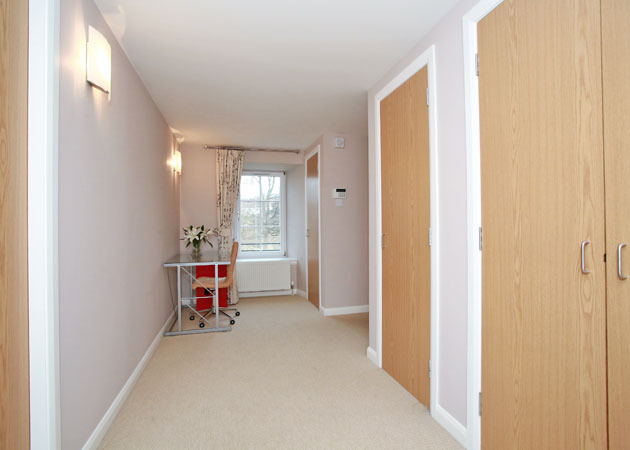 Exceptionally spacious and bridge Hallway providing a unique space to be utilised in a multitude of ways, being currently occupied as an office space. There are three spacious storage cupboards providing both hanging and shelved space. Access permitted to main living space and bathroom. Fitted carpet. LOUNGE/KITCHEN/DINING AREA: 29’5” x 20’11” approx. The main feature of this unique property is the open plan living design incorporating the Kitchen, Lounge and Dining Area along adjacent to the two double bedrooms which are also incorporated into this open plan space. This creates a unique and desirable dynamic throughout. The Kitchen (by Kelvin) has been fitted with a range of Beech base and wall units along with added Breakfast Bar. Siemens Integrated appliances such as the Fridge/Freezer, Electric Oven with Gas Hob, Microwave Oven Extractor Fan, Dishwasher and Washing Machine are all to be included in the sale. 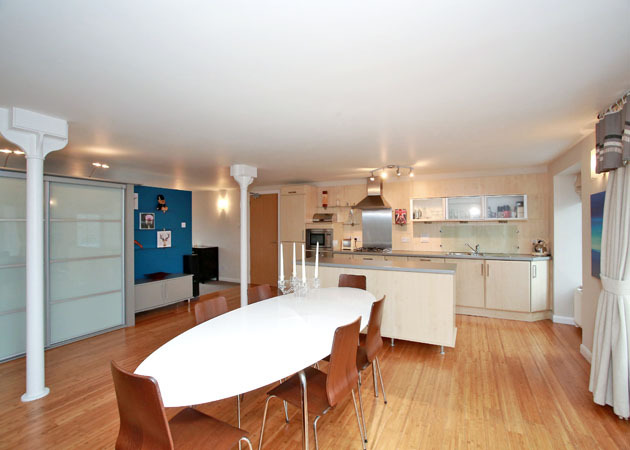 The remaining space is utilised as a spacious Dining Area adequately sized for a large dining table and Lounge area. The area is open to interpretation and can be utilised in many different ways being finished in a neutral tone with quality real wood laminate flooring throughout. 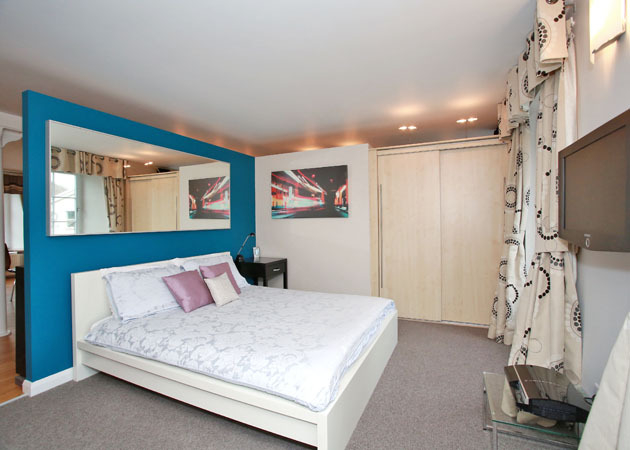 The room benefits greatly from the large double glazed windows to either side filling the room with natural light with the addition of the partial feature coloured wall room dividers to allow this to flow throughout. The very large integrated storage system with 3 glass sliding doors (Kevlin 4000 Series) and side cupboards provides space for housing multimedia units and promotes tidy living. N.B. Television point brackets and cabling to remain in the sale, TV optional. DOUBLE BEDROOM: 14’5” x 10’10” approx. The Master Bedroom, as described, is laid to open plan with the remaining living space however is separated due to partial wall dividers. The area has been finished in a neutral tone and benefits from double door fitted wardrobe space (by Kelvin) with both hanging and shelved space. Relatively new John Lewis wool fitted carpet. N.B. Television point brackets, cabling and current Samsung LCD television to remain in the sale. DOUBLE BEDROOM: 12’6” x 10’6” approx. 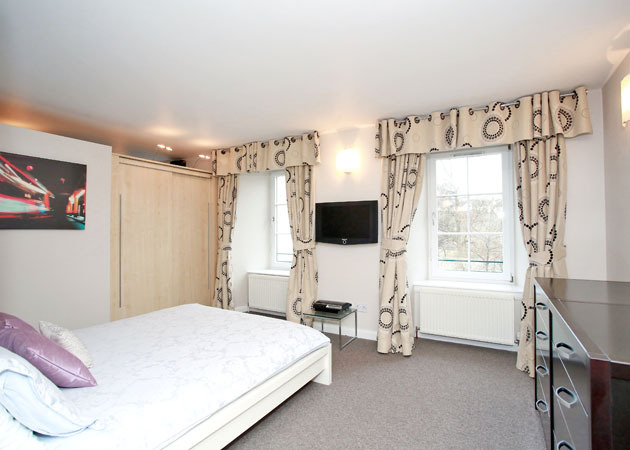 Further Double Bedroom also benefits from pleasant outlook and mirror image fitted wardrobe storage with both hanging and shelved space. Finished in a neutral and appealing décor, and again with relatively new John Lewis wool fitted carpet. BATHROOM: 13’6” x 8’8” approx. The incredibly spacious bathroom has been fitted with a white suite comprising a cisternless w.c., wash hand basin set into a Beech Kevlin vanity unit offering further storage along with the bath and separate shower cubicle with powerful Grohe shower. 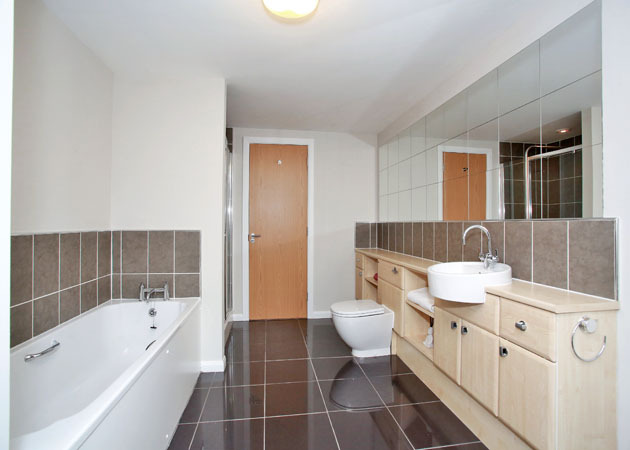 Gloss tiled flooring and mirrored tiled wall creates a sleek impression. Storage cupboard and opaque window. PLAN NB: For indicative purposes, all dimensions are approximate. GENERAL: All floor coverings, curtains, blinds and white goods are to be included in the sale with further furnishings being available via separate and flexible negotiation. Private bridge access towards Great Northern Road available to residents with bollard access system (maximum of 2 key fobs per property). Annual village factoring charges include communal ground upkeep, Mill buildings insurance & maintenance. PARKING: Allocated parking space but benefits from multiple private parking options.